This flavourful strawberry, baby herb, walnut and blue cheese salad is not only visually beautiful, but packs quite a nutritional punch thanks to some certain red gems. The strawberry is a member of the rose family and is the only fruit with seeds on the outside. Research suggests that eating just eight strawberries a day can improve heart health, lower blood pressure, reduce inflammation, reduce the risk of cancers and even improve cognitive function. What’s more, strawberries score in the fruit group with the highest antioxidant content, which can help reduce the risk of macular degeneration. The combination of nutrients in strawberries can also aid in the prevention and suppression of cancer cells. Heat the butter and oil in a frying pan over medium-high heat. Fry the walnuts, 1 minute, then add the herbs and stir until the nuts begin to brown, about 2 minutes. Remove from heat and set aside until needed. 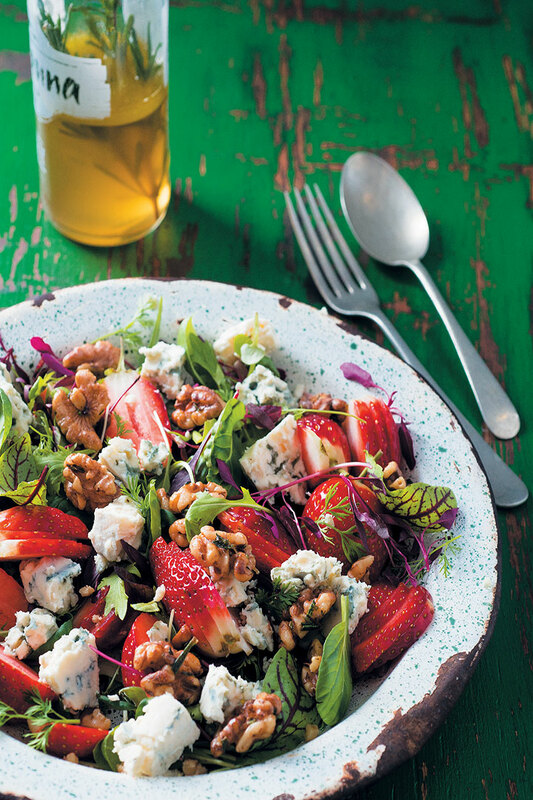 Arrange the salad leaves on a serving platter and top with the walnuts, strawberries and blue cheese. For the dressing, whisk all of the ingredients to combine. Season well to taste.